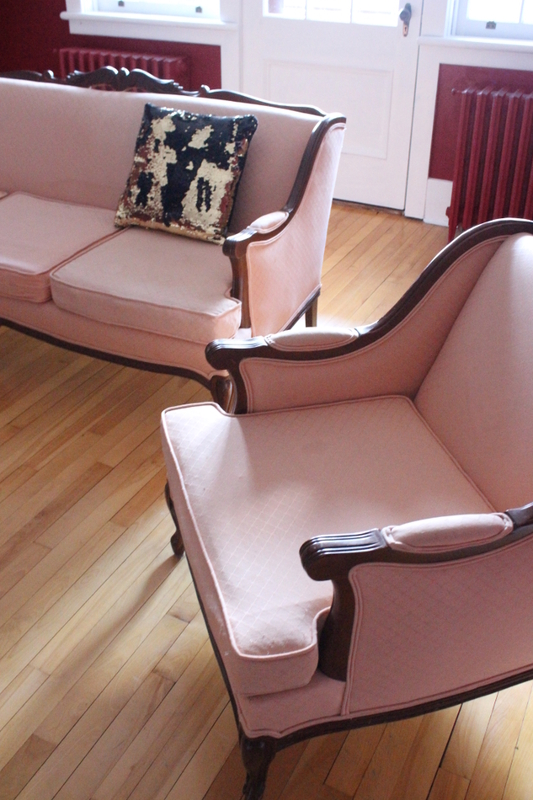 Despite it being a Monday, I’m very excited to share photos of our new secondhand French provincial style sofa and armchair that we got our hands on last weekend through Kijiji! And I am so in love with them. The seller was looking to have the set gone by the weekend, so she marked them as free. F R E E. You can imagine the sounds I made when I saw those four letters, so I sent a message, made a few phone calls later and the next day the sofa and armchair were being delivered to our apartment. 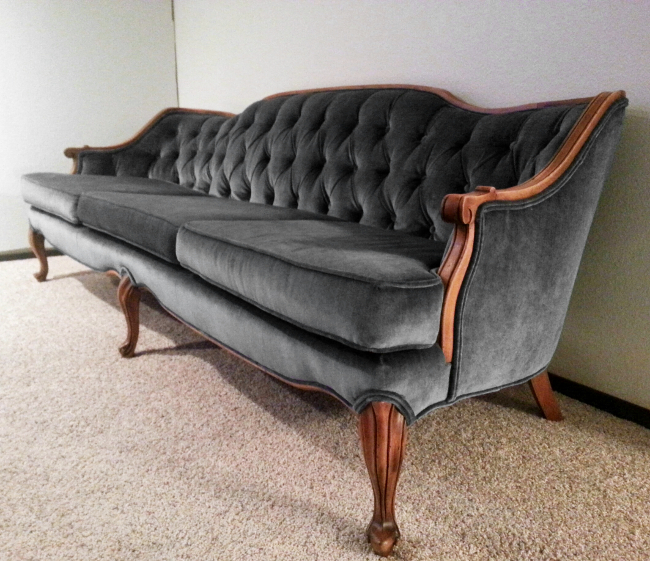 I’ll be getting a few reupholstering quotes in the coming weeks and I’m hoping the cost of reupholstering both pieces will be exorbitantly cheaper than buying a brand new sofa (which I’m not totally against, but the past few months have been very expensive so I’m trying to keep costs down. I might splurge on a new footstool). In the mean time, I’m happy to keep a peachy sofa set in our living room. And so is Juniper, in case you were wondering. Next Post The Interior DIYer on Pinterest! Wow! That is incredible! 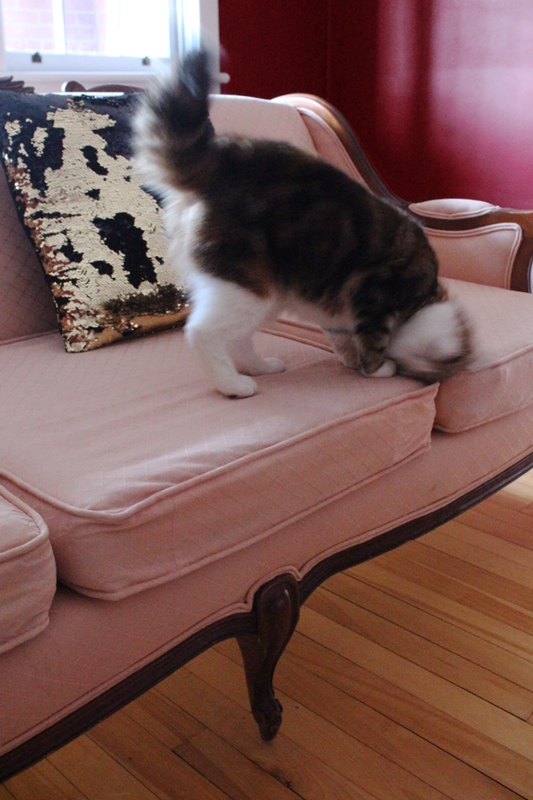 And I love the reupholstering plans you have for it, I really look forward to seeing it. Thank you so much, Yolene! I cannot wait to work on it. Slowly but surely, our living room is coming together! Haha, I know! The colour really is beautiful but the current fabric is wildly impractical. There were a few water stains on the back so I took a damp cloth to it to take the hard edge off the stains but once it all dried, I had rubbed some of the colour off the fabric! It’s easily 30+ years old. I took the seat covers off too and put them in a gentle wash in the washing machine and none of the stains came out. Plus, with the cats being so dark in colour, all you can see is fur on them now (4 weeks into having them). I LOVE the colour but I’m glad I’ve had some time to live with it to get a more realistic gauge of how it would suit us IRL. At the moment I’m thinking a dark velvet would suit us better (as Kimberly will know, cat hair wipes off velvet easily). Practicality is making its point! Free? FREE? What Luck 🙂 I love the style of them and can’t wait to see the transformation! I know! I still can’t believe we got them for free. 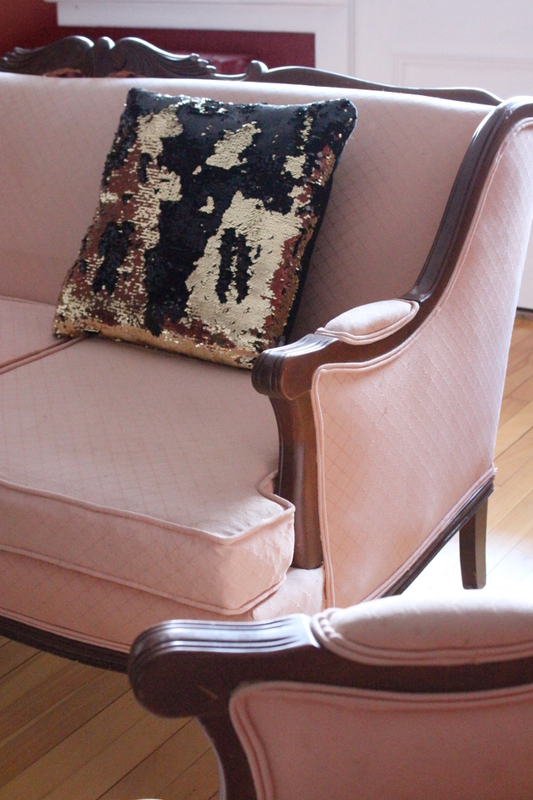 Since posting this I’ve had a new design idea for updating this sofa and I cannot wait to share it! 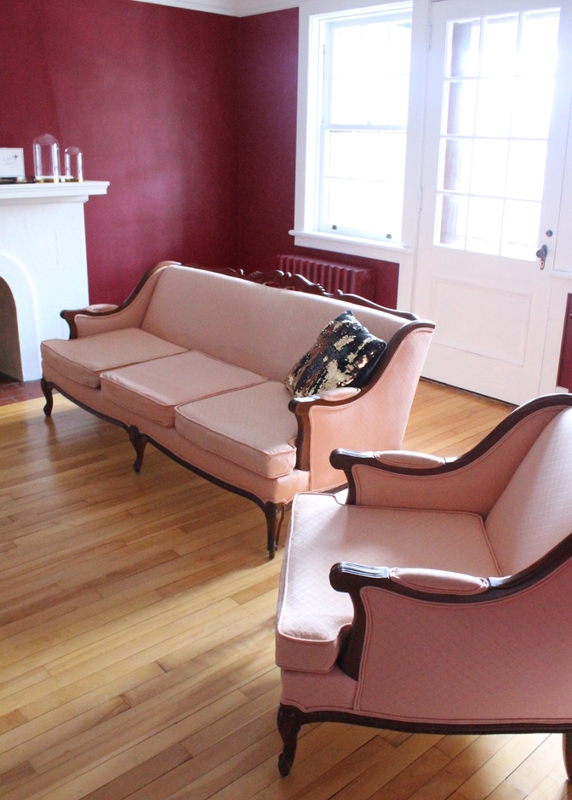 Alex, I cannot get over how great that pale pink looks against the deep wine colour of the walls. Just lovely. I know, right Pat?! The armchair in particular is incredibly comfortable. I really can’t believe how lucky I got with them!